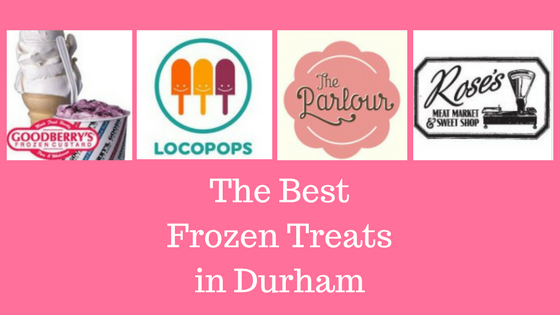 The Best Frozen Treats in Durham, according to a Durham magazine reader’s survey, are Goodberry’s Frozen Custard, Locopops, The Parlour, and Rose’s Meat Market and Sweet Shop. In 2013, Southern Living magazine named Durham the “Tastiest Town in the South” so The Bull City is known for being a “Foodie City” as well. Goodberry’s Frozen Custard is located at 3906 N. Roxboro Street in Durham. Call (919) 477-2552. Did you know that, in 1988, Goodberry’s introduced the Southeastern United States to frozen custard? They use only the freshest of ingredients. Locopops, at 2604 Hillsborough Road, has a physical store and a growing mobile business. Call (919) 286-3500. Locopops is often at Durham Bulls home games as well as local Food Truck Festivals. The Parlour, at 117 Market Street in Durham, makes their pastries, and most of their toppings, from scratch. Call (919) 564-7999. They always offer vegan options, including fruit sorbets, creamy flavors made from coconut milk, and scratch-made vegan baked treats. Open Wednesday through Sunday, Rose’s Meat Market and Sweet Shop is at 121 N. Gregson Street in Durham. Call 919-797-2233. Chef and butcher Justin Meddis joined forces with pastry chef Katie Meddis to open a meat and sweet shop. They sell high quality, local, pasture-raised meats and use local, sustainable ingredients. Morehead Manor Bed and Breakfast is also located in Durham, North Carolina. Our fresh, gourmet breakfasts please our guests each morning. We are happy to accommodate special dietary needs. We only ask that you please tell us ahead of time. There is no shortage of great places to eat tasty food in The Bull City. Especially when it comes to frozen treats. So bring your “Foodie” friends and stay at Morehead Manor Bed and Breakfast. Durham is also home to great entertainment, festivals, gardens, shopping, sports, universities, and much more! This entry was posted in Durham and tagged Durham, Durham Bulls home games, Foodie City, frozen treats, Goodberry's, local, Locopops, Morehead Manor Bed and Breakfast, Rose's Meat Market and Sweet Shop, The Parlour, vegan options by admin. Bookmark the permalink.